That's about half of the amount of whipped cream that Sheryl likes on her pumpkin pie! My son, David, and I have a tradition that we’ve started where we bake a couple of pumpkin pies. They are the opposite of baking from scratch in that we buy canned pumpkin along with a frozen pie crust. We call it “Dump, Bake, Done” in that we dump all the ingredients in a mixing bowl, pour it into the pie crust, bake it and then we are done. 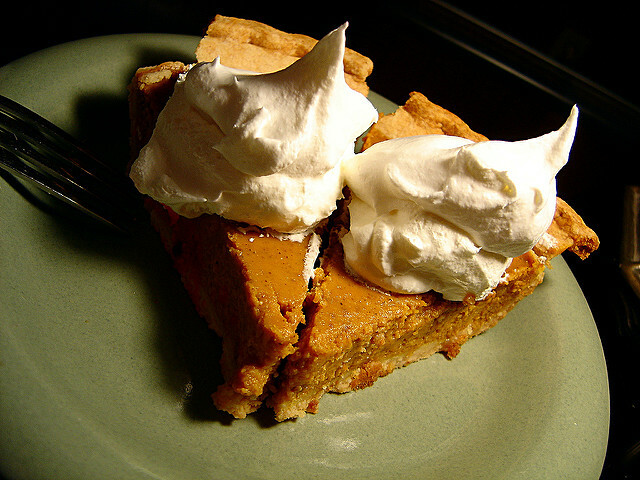 Let’s face it, when you slather a warm piece of pumpkin pie in cool whip, the best piece of pumpkin pie you ever had was probably not all that different from the worst piece. It also has the added teasing bonus of driving David’s sister Kyla crazy in that she has baked from scratch before and insists that we aren’t doing it right! Following Thanksgiving will be Black Friday when the retailers go in the black. Of course, now you can start shopping Thursday night if you don’t mind making people work on Thanksgiving. I’ve done the Black Friday thing before, waking up super early to get to the big box store. While some people may really enjoy the competitive shopping and make this an annual rite, I've discovered it's not for me. All of the feasting, wrangling with relatives and Christmas shopping leads us to the first Sunday of Advent over the weekend. This year, I’m preaching a four-week series entitled, “Preparing for Presence” as we think about the doctrine of the Incarnation. The first Sunday’s lectionary reading is Matthew 24:36-44 and it deals with the unexpected intrusion of God in our lives. It has kind of a negative connotation. I know many people who defend it, saying, “If you are right with the Lord, you have nothing to fear.” Of course, many of these same people often espouse a dim view of humanity and a high regard for our capacity to sin. So according to them, while it might not be difficult to get right with the Lord, it is often difficult to stay right with the Lord. So while the connotation of this passage is often seen as negative, could there be a silver lining to an unexpected visit? As we think about preparing for the presence of God during Christmas, maybe we need to think about how we treat one another. I know that many will want to think about this after Thanksgiving but respect and civility is not lost on our relatives. Hmm. Maybe David and I will not loudly proclaim “Dump!” “Bake!” “Done!” so enthusiastically around Kyla this year. Source: Photo via Flickr.com, used under the Creative Commons license. Newer PostWe Give Thanks for your support of WHIZ KIDS! !